Eddie James is a worship artist, preacher, and the founder of Eddie James Ministries and DreamLife. He also is the founder of Fresh Wine Records, Fresh Wine Publishing, and Fresh Wine Productions. His ministry headquarters is located in Cleveland, TN with ministry centers in Georgia and Florida. His ministries work with several detox centers in Kentucky. Originally from Phoenix, AZ Eddie James has an extensive worship leading and song writing history that began at a young age. 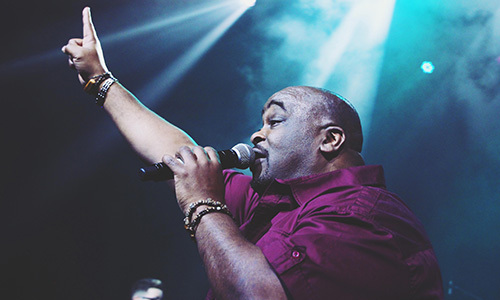 Eddie James is an internationally renowned worship artist, which enables him to release his sound of worship to many of the worlds’s most impactful ministries. These ministries include Bishop TD Jakes, Lou Engle – The Call, Bill Johnson, Bethel Music, Perry Stone, Karen Wheaton, Kirk Franklin, and so many more. His songwriting, production, and artistry has carried his music to the top of Billboard Charts. “I Am”, “Lord, You’re Holy”, “Psalm 23”, “You’ve Been So Faithful”, “Breakthrough” and Freedom” are just a few of the songs for which he is known. His songs have been performed by a wide range of music artists and ministries, from Judy Jacobs, Karen Wheaton, Helen Baylor to Joel Osteen – Lakeland Church, Brooklyn Tabernacle, Mississippi Mass Choir and Lee University, Liberty University, his music and performing arts groups and himself. His works have been featured on Fox News, Glen Beck, Oprah Winfrey Network and “Lion of Judah” produced by Warner Brothers. His music and sound is sought after around the world, evidenced buy his appearances on TBN, God-TV, Daystar, “It’s Supernatural” – Sid Roth, and in magazines like Charisma. Eddie’s music is the sound that trumpets his heart for both God and the broken. Eddie James rescues, restores, and raises up high school and college age youth who are coming out of drug addiction, street life, gangs, violence, and perverse lifestyles through a recovery program known as DreamLife Ministries. When he is not traveling he is with his spiritual and adopted sons and daughters teaching his discipleship program called “Discipleship N Arts” (DNA). Because of this DNA, Edie James Ministries and DreamLife has empowered hundreds of youth to experience a life in freedom and discover their true significance. Many of whom now have ministries of their own or are serving in powerful ministries and churches such as: International House of Prayer (Kansas City) – Mike Bickle, The Call – Lou Engle, Omega International Center – Perry Stone, and The Ramp – Karen Wheaton. Eddie James is clearly a voice anointed to SHIFT a generation back to the heart of God.